The Rivers State Governor, Nyesom Wike, says he is ready to lay down his life if it will ensure victory for the Peoples Democratic Party in the 2019 general elections. Wike said this in the latest issue of ‘The Interview,’ a monthly magazine. The governor said one of the reasons the then President, Goodluck Jonathan, lost the presidential election was that he was surrounded by insincere people, especially ministers. He, however, said Rivers State fought tooth and nail to ensure victory for the PDP in 2015 and 2019 would not be any different. 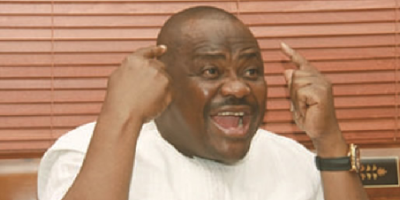 Wike said, “The whole thing boils down to sincerity and commitment and sincerity. We said if things would not happen, all of us would go down with it. That was the driving spirit for us and that is what we are going to repeat in 2019. The governor described Jonathan as a gentleman who condoned too many things. Wike said for instance, when Jonathan went to campaign in the North, he was stoned in a number of states but did nothing. The governor said if he were the President, things would have been different. He added, “God gave every leader his strength and way of doing things. You see, I will not accept that. Let the heavens fall. If Nigeria was going to end on that day, let it end. I will not take what he took. That is why I respect the man a lot. I will not take that. Wike said the fact that those who stoned Jonathan were neither arrested nor prosecuted, showed that some northern elements, including the ones in the PDP, sabotaged Jonathan’s campaign.